The activities of the Bahá’í community are based on the teachings of Bahá’u’lláh, the founder of the Bahá’í Faith. Bahá’u’lláh brought new spiritual and social teachings for our time, underlining the oneness of humanity and religion. Bahá’í activities are open to all, regardless of class, ethnicity or religious background. Inspired by the unifying vision set out in Bahá’u’lláh’s writings, the Bahá’ís of Sheffield invite everyone to walk a path of service and learn together about the process of community building. The community-building activities revolve around meetings that strengthen the devotional character of the community, classes that nurture the tender hearts and minds of children, groups that channel the surging energies of junior youth, and study circles that focus on the application of spiritual principles. 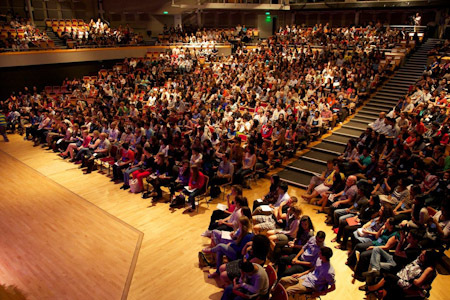 Around 1,000 youth from Iceland, Ireland, Malta and the United Kingdom gather at one of the 114 Youth Conferences held across the world between July and October 2013, to reflect on their participation in Baha’i community building activities.